Sales collateral helps deliver the right information to the right people. Sales collateral is a broadly used term for any content that can be used to educate a prospect so that they can make a buying decision. One of the biggest struggles for salespeople is having the right content to share at every stage of the sales process. 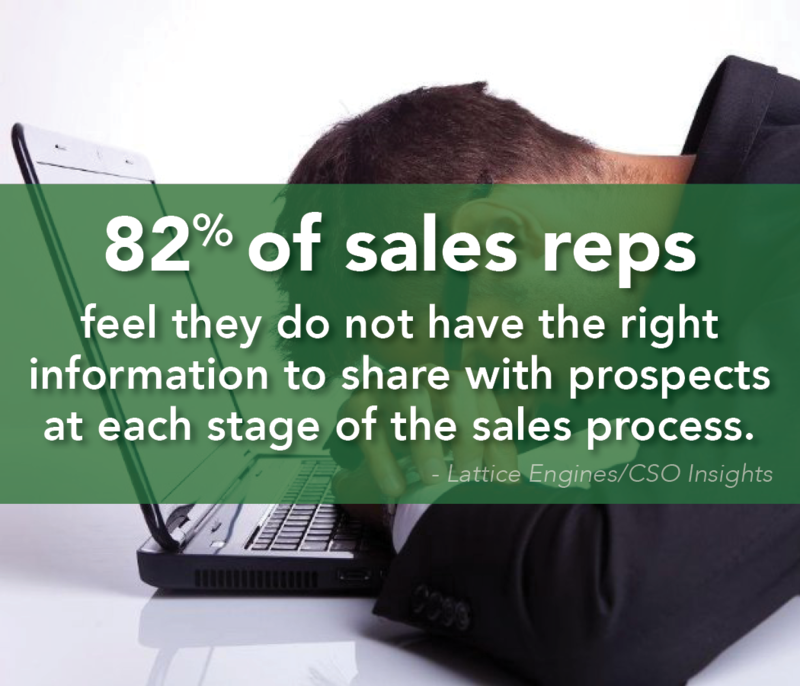 In fact, 42% of sales reps feel they do not have the right information when making a sales call (Source: Lattice Engines/CSO Insights). Further, 90% of marketing deliverables created for sales are never used by salespeople (Source: The New Rules of Sales Enablement). Therefore, it is critical that sales collateral developed by marketing is relevant to each stage of the sales process and that salespeople can effectively utilize the collateral to advance the buying decision. of customers choose the solution providers that offer the most relevant content at every stage of the buying process. Atomic Revenue provides expertise in both marketing and sales operations to accomplish a proven process for effective collateral development. Our collateral development process starts with the Core Messaging Program to develop the foundation for standardized value communications across marketing, sales, delivery, and service efforts. Then we develop effective collateral that aligns marketing presentation with your sales objectives to produce meaningful results. Sell sheets provide a compelling yet easy-to-consume summary of your solution. Initially, they validate interest and enhance desire to learn more, ultimately providing education about the benefits of utilizing your solution. 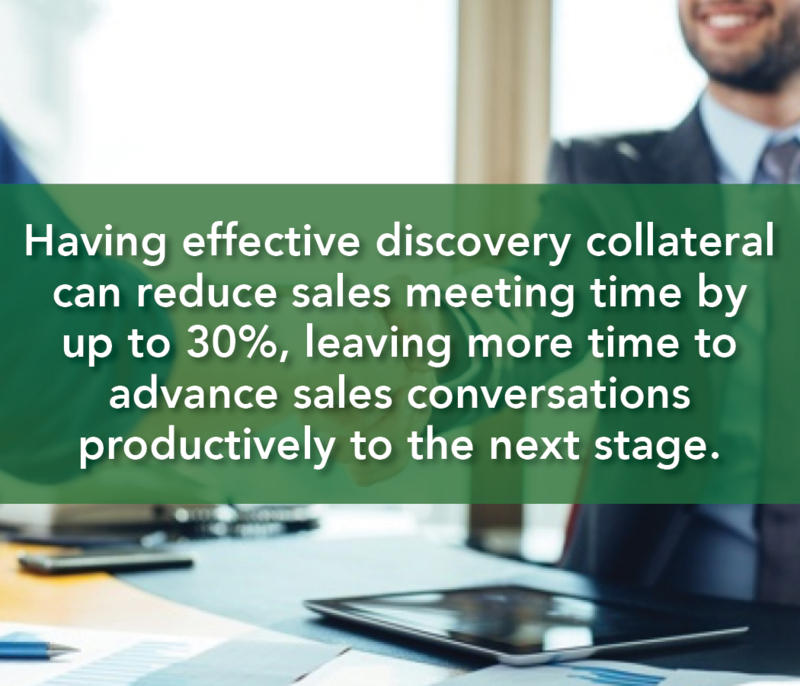 A sales presentation focuses on sales conversion utilizing all core messaging assets to walk a customer through a compelling and interactive process as they make an educated buying decision. Discovery diagnostics collateral extracts organized, consistent and impactful data about your prospect’s needs which drive quality into your solution proposal and confidence into their buying rationale. The language and terminology you helped us develop through the Core Messaging Program have really improved our effectiveness in lead generation, as well as with speaking to new prospects in general. The new messaging helps us quickly convey the value propositions that are important to our customers. The Financial Operations Model by Atomic Revenue was instrumental in gaining traction and generating revenue for our software service company. Tara and Atomic Revenue were invaluable in our process to streamline multiple data points to provide and present the KPI reporting that really matters to Executive Management. Atomic Revenue has greatly impacted my work experience at OMiga, by shortening my sales ramp-up period. Their sales tools have helped me communicate real value to the 17 new clients I have on-boarded since joining OMiga only 7 months ago. One of the most valuable outcomes of our engagement with Atomic Revenue has been the Impact Declarations. Now seeing how powerful they are in collateral it is clear why Value Propositions aren’t enough. When I met Atomic Revenue, bank leadership was happy with our traditional marketing but we had no marketing attribution data. Without performance benchmarks, we cannot measure the effectiveness or return-on-investment of a marketing budget. The market required a shift away from traditional marketing campaigns, but credible ROI metrics would be necessary to measure the improved impacts on buying behavior. This is the problem that Atomic Revenue solved for us. We were looking to build our brand and better understand how to implement a digital marketing strategy designed to attract, engage and retain clients. Atomic Revenue's Digital Operations Audit shed light on what was working, and not working as well as we would like, allowing us to focus on what needed to be done without spinning our wheels. The digital audit Atomic Revenue performed for us was very thorough and was followed up with practical and concrete ways to improve performance, save money and approach our digital marketing efforts."